Who is the Bicycle Repair Man? 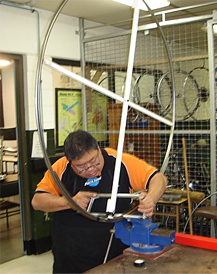 Master Craftsman David Cheung has qualified in all the areas including (including tool making, hydraulics and pneumatics) required to allow him to diagnose and correct your bicycle problems. An experienced mechanic (and a frame and wheel builder! ), David’s passion for bikes has encouraged him to equip his specialist workshop with the kind of tools and jigs you would only expect to find in professional biking circles. As a Craftsman, he knows only the best is good enough for your bike, and as a biking enthusiast and collector, he takes pride in the workmanship done on each individual bike that passes through his highly skilled hands. "I will service your bike as if it were my own, I will provide you with personal service and craftsmanship at the best possible price."